When Yesterday’s Treasures Meet Today’s Marvels, The Results Are Extraordinary! There is little argument when it comes to the allure offered by modern, minimalistic design. With the clean lines and sleek surfaces modern design lends to a space, the effect is – both figuratively and literally – cool. 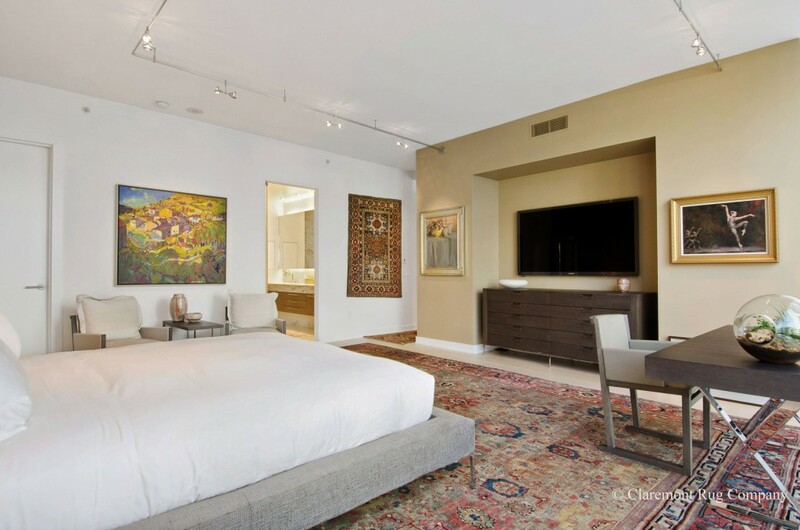 Equally apparent is the exquisite beauty so deeply inherent with antique Oriental rugs. While falling in love with the very different yet equally covetable aesthetics that define modern and classical styles is easy; combining them to create one, spectacular space may appear to be difficult. Despite such challenge, this bringing of old and new together – when done well – results in the creation of refined, striking spaces well worth the effort needed to achieve them. 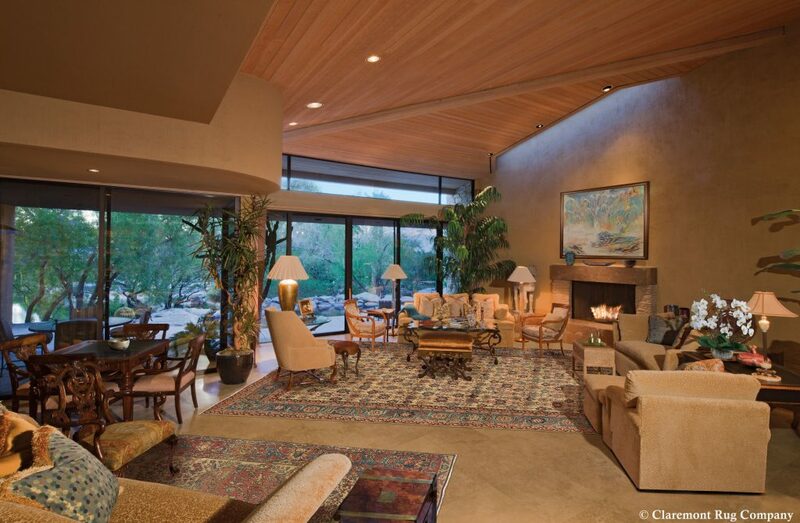 Described as “aficionados of art” by Jan David Winitz, President and Founder of Claremont Rug Company, those who temper their modern spaces with the warmth and elegance of well-chosen older rugs are rewarded richly. “Our clients who have discovered ways to use these pieces to express their personal tastes have done so by putting to use their own innate creativity and style,” explains Winitz. Indeed, through layering, hanging and otherwise displaying their very traditional rugs in admittedly untraditional ways, these collectors create an aesthetic that is at once classic and modern, textural, imaginative and utterly all their own. 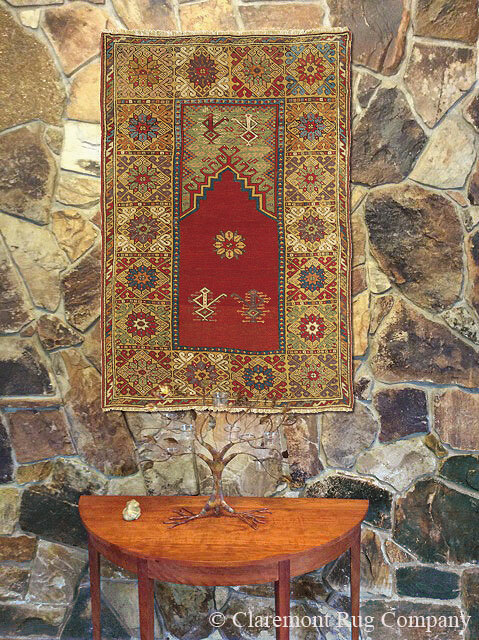 While Winitz is quick to say that any of the myriad styles reflected in his 19th and early 20th century Persian and tribal rugs can be designed to work within a modern space, that many clients have found antique Laver Kirman rugs, those finely wrought examples representing an important part of the Persian floral rug-making tradition, are particularly well suited. “The small, botanical designs and beautiful tones found in Laver Kirman rugs tend to balance the sharp angles and stark palettes found in modern, minimalistic design,” he says. Another stellar, design standout when introducing these classic pieces into a modern, industrial setting is the art of grouping several rugs together to create enormous impact. Whether displayed on a wall or grouped underfoot, the ebullient interplay of color and design that ensues through the overlaying of multiple rugs within one space can be utterly enchanting. Winitz recalls a client who created what he referred to an “exquisite mosaic of color and interest that was somewhat reminiscent of a Cubist painting” by layering eight rugs at various angles to achieve an intriguing balance of angles, tones and textures. “We worked with her to arrange and rearrange the selection until their interplay resulted in a perfect symphony,” said Winitz. Because after all, perfection does have its rewards.